So I made the little bat from Ellis & Higgs Creepy Critters Blocks, and he is awfully cute! And since I was doing so well, I decided to go for the spider. Probably should have quit while I was ahead. Spiders are hard! 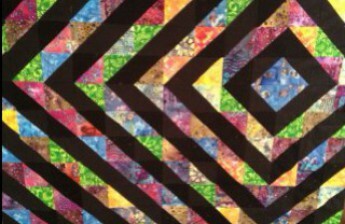 Rather than use the instructions on the pattern, which called for squares with diagonal stripes, I decided to make everything with half square triangles. I was afraid that my diagonal stripes wouldn’t line up. Well, as it turns out, neither did my HSTs and it was probably about ten times more sewing, cutting and ironing! Oh well! Cute in the end, but far from perfect. At first everything lines up nicely, but once it is sewn together…not so much! These came from a tutorial from Happy Sew Lucky, called the Eyeballs Quilt Block Tutorial. I haven’t decided if these will get sashing, or how they will be layed out yet. But the goal is to get it done by Halloween, which gives me two more days!